The family of Inspector Subodh Singh, who lost his life in the Bulandshahr violence on Monday, pointed fingers at the police alleging that the cop was killed as he was probing the Akhlaq case. Singh’s sister, Sunita, demanded that her brother be declared a martyr and a memorial erected in his honour. “My brother was investigating Akhlaq case and that is why he was killed,” Sunita was quoted as saying by ANI. “It is a conspiracy by Police. He should be declared a martyr and memorial should be built. We do not want money,” she added. Singh had probed the 2015 lynching of Mohammed Akhlaq in UP’s Dadri, also over allegations of cow slaughter. Targeting Chief Minister Yogi Adityanath, who is currently in Gorakhpur with Chhattisgarh CM Raman Singh, Sunita said that the “CM only keeps saying cow cow cow”. Abhishek, the son of the deceased policeman, expressed outrage at the growing incidents of religious violence in the society. “My father always wanted me to be a good citizen who doesn’t incite violence in society in the name of religion. Today my father lost his life in this Hindu-Muslim dispute, tomorrow whose father will lose his life?” he said. Meanwhile, the mortal remains of the cop were brought to his residence at Etah today following a wreath laying ceremony in Bulandshahr. 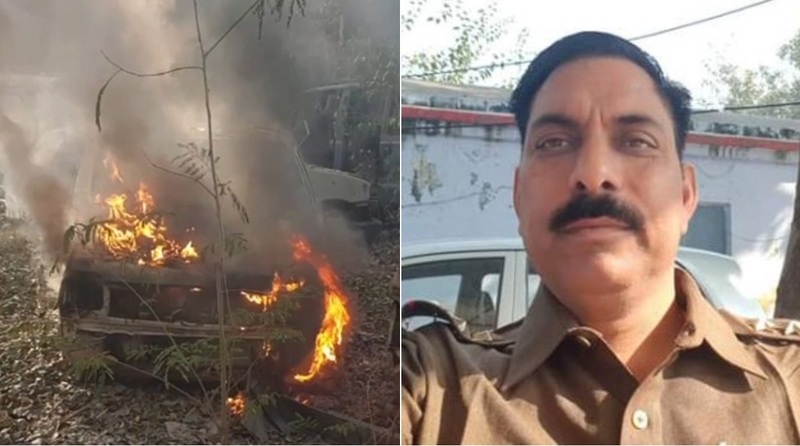 Subodh Kumar Singh, the SHO of Bulandshahr’s Syana police station, was shot dead from point blank range when he attempted to clear the traffic snarl caused by angry villagers on the Bulandshahr road at Chingravathi. According to a statement issued by the police on Monday, the villagers had got information from the Gram Pradhan in the morning that cow meat had been found in Mahavas village, after which Inspector Singh went there for an investigation. Two Special Investigation Teams (SITs) were formed on Monday. At a press conference in Lucknow, Prashant Kumar, ADG (Law & Order), Meerut Zone, said that IG Meerut Zone will head one of the SITs to investigate why the violence happened and why Inspector SK Singh was alone at the scene of crime. The UP Police arrested two men and detained four on Tuesday in connection with the violence which also claimed the life of a protester identified as Sumit. An FIR under IPC sections dealing with murder, rioting and assault was filed against 28 people including Yogesh Raj, reportedly a senior Bajrang Dal leader who had earlier lodged a police complaint alleging cow slaughter. The FIR also lists 60 unnamed people. On Tuesday, SP Shirodkar, ADG Intelligence, inspected the spot where Inspector Subodh Kumar was killed. He said that a report will be submitted by 5 December evening. The situation is still tense in Bulandshahr. Security forces have been deployed in large numbers in the district and adjoining areas.